This is a territorial museum, which tells the story of the archaeological landscape (from Ancient Neolithic to the Byzantine period) in a very informative exhibition. The museum is the heart of the Museum System of the town of Carbonia and is the centre of an entire chain of cultural heritage: from excavations to cataloguing, from exhibitions to diffusion. Owned by the Municipality of Carbonia for research on the extraordinary Nuraghe Sirai and renovated in 2008 to give its current structure, it exhibits the finds of excavations carried out at numerous sites in the area: the shelter of Su Carroppu, the Domus de janas necropoli of Monte Crobu and Cannas di Sotto and Locci Santus, the main archaeological area of Monte Sirai – Nuraghe Sirai, which has become the largest Archaeological Park in the Sulcis region. The extremely informative arrangement of the rooms is the ideal background for the numerous educational workshops and services the Museum offers schools. The Sala del Territorio includes the entire area: from Su Carroppu di Sirri to Monte Crobu, from San Giovanni Suergiu to Su Fussu tundu di Santadi, from the Nuraghe Sirai to the temple of Bagoi a Narcao. It tells the story first and foremost of the prehistoric and protohistoric periods: the first agriculture, the villages, the cult of the gods and the cities of the dead in the Neolithic period (6000-3300 BC, ca. ); the contacts with European cultures, the first metal working in the Enolithic era (3300-2200 BC, ca. ); the cultures of the Bronze Age (2200-900 BC, ca. ), with the development of the Nuraghic civilisation; the changes in the Iron Age (900-510 BC, ca.) and the contacts with the Greeks, the Etruscans and above all with the Phoenicians. Past scenes of the ancient Via Sulcitana, we come to the Sala del Sulcis fenicio, illustrated by materials from Sulky-Sant’Antioco and the coastal town of Bitia. In the Sala di Monte Sirai, life in the Phoenician town is described according to various topics (the temple and the gods, architecture and domestic activities, burials and burial rituals) and cross-sections of daily life. 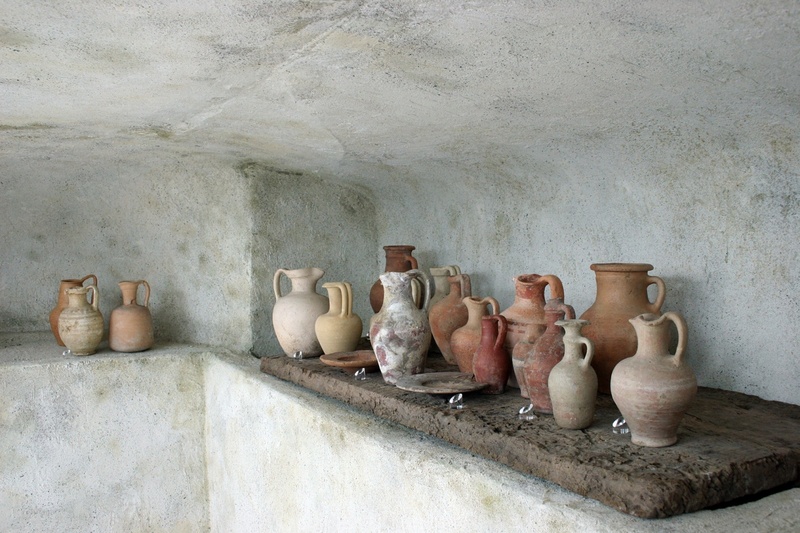 You will be able to enter the Punic town with a detailed reconstruction of a kitchen, the chamber tomb no. 10 and the tophet. Following in a circle on the left-hand side you come to the landscape in the Punic and Roman era: on your return to the first room you come back to the Roman era (238 BC - 500 AD, ca. ), with the milestones of the Via Sulcitana and the necropoli of Carbonia. April-September 10.00 a.m.-1.00 p.m. / 2.00-7.00 p.m.
October-March 10.00 a.m.-1.00 p.m. / 2.00-4.00 p.m.